Posted by Yilan in EU, European Union, Germany, Yunanistan. German Chancellor Angela Merkel visits Greece while the country remains locked in negotiations with its creditors over a package of austerity measures. Dow Jones’s Jenny Paris discusses the latest developments. The Greek capital was bracing for a security clampdown as Prime Minister Antonis Samaras welcomed German Chancellor Angela Merkel on Tuesday on her first visit to Athens since the debt crisis began. 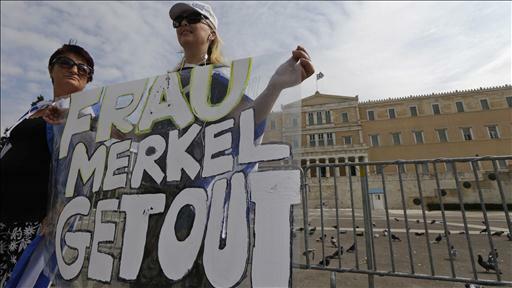 In a sign of the reception Ms. Merkel is likely to receive on her seven-hour stopover in the Greek capital, several thousand demonstrators gathered in the city’s main Syntagma Square on Monday evening, blaring revolutionary music from loudspeakers and holding banners decrying planned government austerity measures, which many Greeks blame on Ms. Merkel. German Chancellor Angela Merkel will visit Athens on Tuesday but she will likely be met with mixed reaction from the Greeks, Charles Forelle discusses on Markets Hub. Fearing wider protests will cast a shadow on the leaders’ effort to promote an image of renewed solidarity, police were expected to dispatch some 7,000 officers, coast-guard personnel, sharpshooters and navy divers, in what is being billed as the biggest security operation since then-President Bill Clinton came in late 1999. The police presence will be bolstered by six-foot-high metal barriers outside Parliament, two police helicopters, and 10 extra riot-police units—with a water cannon on standby, according to state-owned television. Police have banned all gatherings Tuesday in a one-square-kilometer area encompassing the prime minister’s office and the German Embassy, while staff inside Greece’s tightly guarded Parliament building have been told not to show up for work. Many analysts expect the chancellor to reaffirm Greece’s place inside the euro zone—something that looked in doubt just a few months ago—and express her sympathy for the sacrifices made by Greeks in an austerity push that has driven the economy into a five-year recession and unemployment to record highs. The visit comes amid a recent thaw in relations between Ms. Merkel and Mr. Samaras—a longtime critic of the austerity measures that are a quid pro quo for Greece’s latest €173 billion ($224.3 billion) bailout—whom Ms. Merkel blamed for undermining the previous government’s reform efforts. But since coming to office in June at the head of a three-way coalition, Mr. Samaras has changed tack and now supports the bailout, something that has won him the backing of the German chancellor. Ms. Merkel—facing a German electorate deeply skeptical over Greece’s bailout—is expected to renew her warnings to Greece that it must abide by its reform program. Few expect her to offer any specific proposals to ease the pain of Greece’s adjustment. 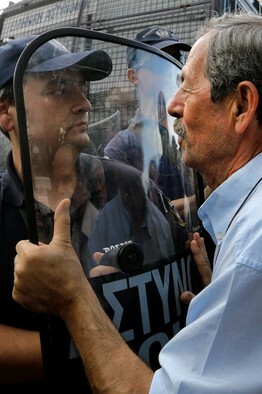 A Greek pensioner protesting against austerity cuts, confronted riot police in Athens as tensions built on Monday, the eve of German Chancellor Angela Merkel’s visit to Greece. Her visit also comes as Greece remains locked in negotiations with a visiting troika of international inspectors from the European Commission, the International Monetary Fund and the European Central Bank on some €13.5 billion worth of austerity measures the country must take over the next two years to cut its budget deficit. An agreement on those measures, as well as other structural reforms, are a precondition for Greece to receive the next tranche of aid promised under the terms of its bailout. If it doesn’t receive that next 31.5 billion aid tranche, the Greek government risks running out of money in November. Although the details of the austerity package are still being negotiated, the measures are expected to bite deeply, slashing pensions across the board and further paring back wages and bonuses in the public sector. In the face of those cutbacks, most Greeks view Ms. Merkel’s visit as a mixed-blessing. Posted by Yilan in EU, European Union. Workers in the indebted eurozone’s countries have become cheaper to hire, although wages in the region as a whole show growth, according to research prepared by the European statistics agency Eurostat. Eurozone hourly wages in the second quarter grew 1.6% year-on-year, Eurostat says. But Greece shows the weakest results in terms of income growth after hourly labor costs fell by almost 12% in the first quarter, following a drop of more than 8% in the previous three months. Eurostat data shows salary costs in Greece dropped by 10.9% year-on-year, while non-salary costs, including social security contributions, shrank by 12.5%. Meanwhile the total cost of labor at enterprises shrank by 8.9%, but in the public sector it fell by 15.7%, reflecting the large cuts to civil servants’ salaries. Meanwhile German labor costs rose 2.5% in the second quarter, after adding 1.8% in the first quarter and growing 3.1% by the end of 2011. In Greece, average gross annual earnings were 28,000 euros in 2009, according to the latest figures published by Eurostat, while Spain had average gross earnings of 26,500 euros per year in 2009. For comparison, average German income was 41,000 euros, while in Denmark it was 53,000 euros during the same year. Posted by Yilan in EU, European Union, France, Yunanistan. Greece‘s finance minister on Thursday denied a report citing the country’s representative to the IMF as saying Athens would need a third bailout package. The euro weakened against the dollar on the report, which was later also denied by the official quoted in the article and came as international inspectors are mulling handing over the next tranche of Greece’s second aid package. “The country’s positions are formulated by the Prime Minister and the Finance Minister,” Greek Finance Minister Yannis Stournaras told Reuters in response to the Dow Jones/Wall Street Journal report. The article quoted Thanos Catsambas, Alternate Executive Director at the IMF Executive Board representing Greece, as saying the country would need a third bailout from European creditors. 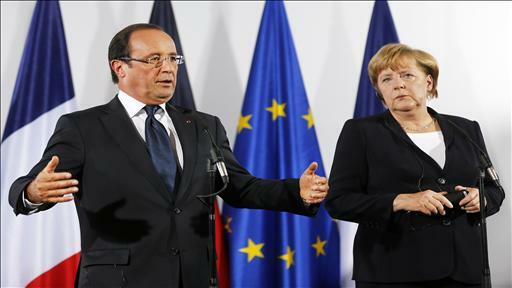 It also reported Greece could not bridge a funding gap and had met only 22 percent of targets for the second bailout. The euro fell to a session low of $1.2881, with traders citing the report of Greece needing a third bailout, and was last at $1.2898. Catsambas issued a statement saying the article included “at least three important inaccuracies”. “There was never a discussion or reference to a third bailout program, as the title of the article wrongly states,” he said. He also denied that he had said the euro zone and European Central Bank (ECB) should fill Greece’s funding gap, as reported. “I do not take any position regarding Greece’s euro zone partners. My statement was that the IMF has provided a four-year financing through the Extended Fund Facility and that at this juncture, no additional financing is envisaged,” he added. Inspectors from the so-called troika of the International Monetary Fund (IMF), European Commission and ECB are in Athens to evaluate Greece’s progress on agreed targets before releasing the next, 32 billion euro ($41.30 billion), tranche from a 130 billion euro aid package. IMF spokesman Gerry Rice said in Washington that talks were focused on making progress with the current bailout. Cash-strapped Greece must come up with nearly 12 billion euros of extra cuts for the next two years to get the money, and it has fallen behind in reforms. Posted by Yilan in EU, European Union, Yunanistan. Seeking a four year deadline to fulfill debt reduction targets and spending cuts … Antonis Samaras. GREECE’S eurozone creditors are demanding that the government introduce a six-day working week as part of the stiff terms for a second bailout. The demand is contained in a leaked letter from the ”troika” of the country’s lenders, the European Commission, European Central Bank and International Monetary Fund. In the letter, the officials policing Greece’s compliance with the austerity imposed in return for the bailout insist on radical labour market reforms, from minimum wages to overtime limits to flexible working hours. This is likely to worsen the standoff between the government and organised labour. After a long delay caused by months of political paralysis in Greece, the troika of inspectors return to Athens this week to scrutinise observance of its bailout terms. They are expected to deliver a verdict next month that will determine whether Greece is ultimately allowed to remain in the single currency. The letter, sent last week to finance and labour ministries, orders the government to extend the working week into the weekend. ”Measure: increase flexibility of work schedules: increase the number of maximum workdays to six days per week for all sectors. The instructions focus on labour market reforms, calling for the national labour inspectorate to be radically reformed and put under European supervision. The letter reveals the detail of eurozone intrusion into a national system and culture of work widely seen outside Greece as dysfunctional. There should be a permanent ”single-rate statutory minimum wage”, seen as an incentive for getting people back to work in a country where unemployment has soared to about 30 per cent. ”Unemployment is too high, and policies are needed to prevent it from becoming structural,” the letter says. It also calls for non-wage labour costs to be lowered, employers’ welfare contributions to be cut, and deregulation of the labour market. There is growing conviction in Berlin and Brussels that the government of Antonis Samaras has fallen well behind in the economic and fiscal reform programs imposed in return for two bailouts in the past two years. The government is struggling to come up with persuasive policies to enact spending cuts. 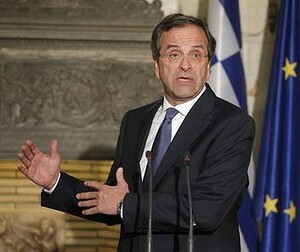 Mr Samaras is pleading for more time – four years rather than two – to fulfil debt reduction targets and spending cuts. Golden Dawn has been in the news before, most notably when one of its representatives repeatedly slapped a female opposition party representative on live TV after throwing water in the face of another female opponent a moment earlier. Now, they are in the news again, this time for attacks by their supporters on military bases where immigrants, who have been arrested and detained by the government under the Xenios Zeus program, are being held, according to the Greek Reporter. The news highlights one worrying trend in Greece — In the past year, Greece’s Golden Dawn party’s rise in popularity, along with a rise in violence against immigrants, have followed each other step by step. The stories about violence against immigrants are alarming, sometimes gruesome, and growing in number. With a five year long recession only being exacerbated by austerity measures, resentment against the rest of Europe (especially Germany) has been accompanied by resentment against immigrants, who are portrayed as taking the resources, jobs, and opportunity meant for Greeks. The Golden Dawn party has capitalized on this phenomena, surpassing the 3% threshold in Greece’s Parliamentary elections needed for representation. Golden Dawn appeal to a country hit by tough times. At one event, where Golden Dawn members and supporters handed out food in front of the Parliament. There was a catch, however — they only gave out the food after people showed ID cards proving they were citizens, have helped to combine the messages and in effect, soften the anti-immigration policy into the mainstream. 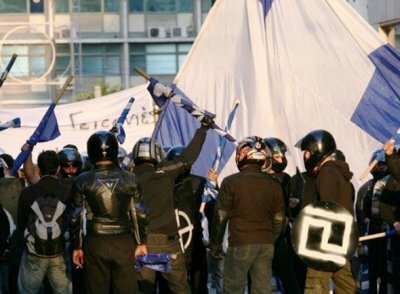 Critics argue that these events are only a smokescreen for the more violent acts carried out by Golden Dawn members. “At night they beat people up. And by day, they hand out food,” said left-wing Athens city councilor Petros Constantinou, in an interview with the AP. Even more startling may be how the government is handling the situation. Instead of calling for an end to the attacks or cracking down through increased surveillance by the police in troubled areas, it has acted as an instigator. At the start of August, 4,500 police captured and detained more than 7,000 immigrants in Athens in a 3-day period. These actions came as Greece’s Public Order Minister Nikos Dendias stated “We will not allow our towns, or our country, to be occupied and become a migrant ghetto”, reports the Guardian. Dendias also said he believed the immigration problem may be more serious than the economic problem. The reasoning for this seems clear. Exit polls from the 2012 Parliamentary elections in May found that in some areas, approximately 50% of the police force voted for the party, reports the Independent. Illegal and legal immigrants have begun trying to call attention to their plight, despite heavy resistance. Last week, 3,000 people attended a protest in front of Greece’s Parliament, reports RT. Signs emblazoned with messages like “No Islamophobia” and “Neo Nazis out!” were held high in what was believed to be one of the largest anti-racism rallies in Athen’s history. Golden Dawn’s spokesman and parliament member Ilias Kasidiaris quickly condemned the government for allowing the rally, saying the Constitution protects gatherings of only Greeks, not foreigners. Fittingly, Kasidiaris is the same man who assaulted the female opposition party member on live TV not long ago.